This is a fun addition to any Easter Hunt! Quick to make and uses up scraps. Cotton yarn was used for project shown. Stuff the egg at this point. 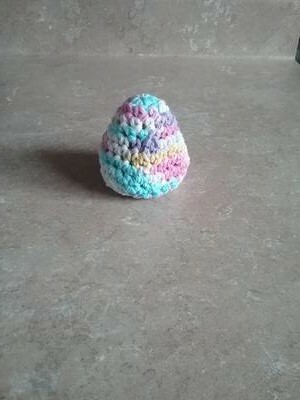 Project shown used popcorn kernels, however if an egg shaped stuffy is desired simply use fiberfill instead of popcorn. Row 12: single crochet 2 together around row and join with a slip stitch. Sew closed.